Submitted by Alexander Briones on Sep. 12, 2018. First published on July. 26, 2017 and last updated on September 12, 2018. Here we look at the best travel guitars, covering both acoustic and electric models, designed to let you enjoy the sound and playability of regular guitars, without the bulk and extra-weight. More importantly, you no longer have to risk damaging your main guitar in long trips. To ensure that current market favorites are featured, we have updated this guide to include the latest reviews and ratings, including those reported up to early September 2018. The humble parlor guitar continues to be a popular portable instrument, even with so many modern alternatives. The Gretsch G9500 is a great example of its staying power in the market, with its classic design that reproduces the vibe and feel of old Gretsch Rex guitars from the '30s. More importantly, it comes with a compact form factor that makes it an ideal portable instrument, or a grab-and-go couch guitar. 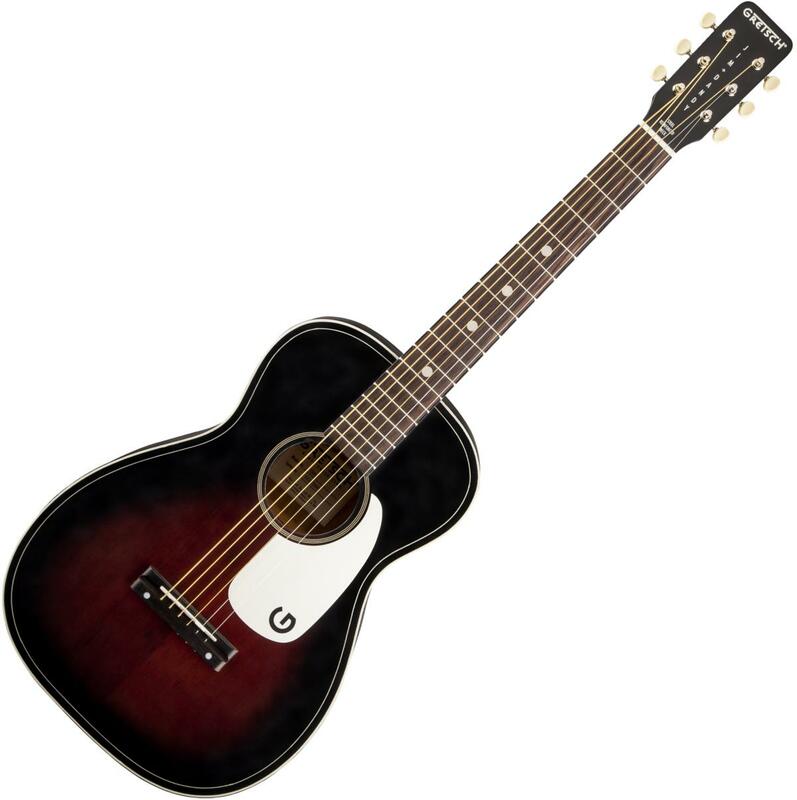 One user summarized market sentiment nicely by saying that the Gretsch G9500 Jim Dandy is "surprisingly good". And most users share the same experience, only worded differently. Reports of it exceeding expectations in terms of build quality are rampant, while others are happy with its distinct tone, especially when compared to regular acoustics. Some minor aesthetic flaws are reported, but even those who rate the G9500 slightly lower have mostly good things to say about it. The Gretsch G9500 Jim Dandy is not only a good acoustic guitar to carry around, it is also a great way to check out what the parlor guitar is all about. Known for their premium acoustic guitars, Taylor has set its eyes on the entry level market with their compact "Baby" series of guitars, the BT2 being among the best rated in their line up. This guitar is essentially a smaller version of the popular dreadnought shape, albeit with Taylor's brand of build and sound quality. While it was initially designed to be a starter guitar for kids, it made its way into the hands of professionals who appreciate its balance of portability and quality. This guitar features a solid mahogany top, and layered sapele for the back and sides, a potent combination that complements the midrange'y tone expected of small body acoustics. Sound quality and playability are the top two reasons cited by reviewers for why they love the Taylor BT2. A lot of users appreciate its warm tone, which works well with various musical styles, from folk fingerstyle to strumming. Others are equally pleased with its overall build quality. For the price, many also consider the inclusion of a solid mahogany top in conjunction with the Taylor brand to be a great deal. There are a few who gave the Taylor BT2 lower scores because of the included gig bag, which some describe as sub-par. Some users also caution that those who are looking for a full sounding acoustic guitar will probably not like the distinctly warm tone of the Taylor BT2. All in all, the Taylor BT2 is a travel guitar that you won't be ashamed of carrying around. 93 out of 100. Incorporating 275+ ratings and reviews. There's no denying the popularity of the "Little Martin" LX1E, it gives the guitarists a chance to own a proper Martin guitar that's reasonably priced and portable. But more than just a parlor/travel guitar, the LX1E is a true workhorse instrument, with its solid sitka spruce top, sturdy HPL back and sides, and stage ready Fishman Isys T electronics. So much so that it continues to be the instrument of choice for many musicians, including big name artists like Ed Sheeran who plays a Martin LX1E signature, even when he can afford other more premium alternatives. In the eyes of its users, the "Little Martin" is anything but small - rather many of them revere it as the best travel acoustic guitar on the market. It's genuine woody Martin tone continues to rake in good reviews, while others are drawn in by its practical portability, elegance and playability. Still, there are a few experienced players who nitpicked on some workmanship/cosmetic issues, most of which are on the neck, but they are still happy with the instrument overall. If you're looking for a workhorse travel acoustic guitar, then the Martin LX1E is perfect for you. As the label implies, the Journey OF660M Carbon Fiber does away with traditional wood to turn it into a super reliable travel guitar. As special as that may be, the carbon fiber body of this guitar takes a second seat to what really makes this guitar special: which is its removable neck system. While removable necks are nothing new, the Journey OF660M has pulled it off in a way that detaching and attaching the neck is convenient and very easy - without straying too far from the familiar acoustic guitar shape. It even comes with a matching gig-bag so you can safely store the neck and body separately, while keeping the strings in a position where it doesn't break or scratch the guitar. More and more guitarists are becoming fans of the OF660M, and it's not surprising because of its incredible reliability and portability. It has been reportedly put to work in places that would mess up wooden guitars, including beaches, boats, mountain trails and many more. It also impresses guitarists for its sound, which many describe as surprisingly full sounding. Those who prefer wood over carbon fiber will not find this guitar appealing. There are also some comments about the guitar's lack of acoustic projection, but this is to be expect, given its use of special materials. If you're willing to make the investment and go beyond conventional acoustic guitar builds, then the Journey OF660M will make a great traveling companion. Since wood is easily affected by humidity and temperature, manufacturers like Composite Acoustics have moved to more robust and resilient materials like "Carbon Fiber". The use of this light and sturdy material, combined with its one piece body-and-neck design makes the Cargo ELE a truly reliable acoustic guitar that can handle extreme weather, humidity and temperature changes. But its not just about reliability because the carbon fiber material and its shape is designed to give the instrument a sound that's similar to traditional acoustics. Finally, each Composite Acoustics Cargo Ele comes with an LR Baggs Active Element system which allows for genuine acoustic tones when plugged in. Even with its premium price tag, those who invested in the Composite Acoustics Cargo ELE have mostly good things to say. Most are impressed with its superb reliability, but its not just about being durable because many are just as impressed with how the instrument sounds both acoustically, and when plugged in. Build quality is also commendable according to most. There are a few who are not too happy with some details, like the C shape neck being a bit flatter than usual. And this is not a guitar for purists, or for those who want something with traditional wood. If you have the budget, or if you are willing to invest in a super reliable travel acoustic guitar then the Composite Acoustics Cargo ELE is for you. Here is an acoustic travel guitar that's not rating as highly as the others, but we've mentioned it due to its popularity. 83 out of 100. Incorporating 700+ ratings and reviews. While it is not as highly rated as others, the Martin Backpacker is still very popular and relevant, so we made sure that it gets a special mention in this guide. For a company that's known for sticking with familiar designs, the Backpacker shape is easily the odd one out, but appropriately so since it is meant to provide guitarists with a compact and portable Martin quality acoustic. It's unique shape and compact profile is well appreciated by many players, while others commend its playability and build quality, which is expected of a Martin designed guitar. Many are simply happy that they can own a good quality Martin guitar at a modest price point. Ironically, the Martin Backpacker's shape riles up a few feathers, with reports of the guitar being hard to play without a strap. There are also a few complaints about its volume, but this is more of a physical limitation than an actual problem. The Martin Backpacker is definitely not for everyone, but we feel that it is well worth considering. 86 out of 100. Incorporating 325+ ratings and reviews. Many decades after it was first released, the Fender Stratocaster is still among the most familiar electric guitars in the market. As such, you can see various iterations of the guitar, be it in price categories, colors and sizes. Speaking of size, the Squier Mini Strat is the student-friendliest of the lot, sporting a compact 3/4 size profile that also makes it viable for musicians who like to travel a lot. Aside from the size and pickup control configuration, the Squier Mini Strat is very much like its regular sized sibling in terms of tone, playability and sonic flexibility, albeit with some cost cutting done on the parts and build. The general consensus is that the Squier Mini Strat is a great beginners guitar, with enough depth for even experienced players to appreciate. Many also commend it for its eye candy finish and overall appearance. There are some reports of the guitar going out of tune rather quickly, a typical problem with affordable guitars that can be remedied with some adjustments or upgrade parts. Check out the Fender Squier Strat Mini if you're looking for a familiar yet compact instrument to take on the road. Weighing in at just 3.125 lbs and with a total length of just 28", the Traveler Ultra-Light Electric is considered to be the lightest and shortest electric guitar that retains full-scale length playability available today. It features a 24.75" scale length, similar to many LP style guitars, and a standard nut width of 1.75" . It utilizes the company's distinct tuning system where in the tuners are located in middle of the body, removing the need for a headstock. It also features a detachable frame that allows you to sit the guitar comfortably on your legs. Finally, it features a dual rail humbucker that can handle both clean and overdriven tone much like a regular electric guitar. The Traveler Ultra-Light Electric guitar appeals to guitarists who are looking for a portable practice axe with similar playing feel as their Les Paul style instrument. Most reviewers commend it for its incredibly light and portable design. Ironically, there are some who are on the opposite side of the fence, complaining about the body being too light, which makes playing a bit awkward, especially when digging the strings hard in rock, metal and similar music styles. The lack of volume and tone controls also raised a few eyebrows. Still, if portability is your top concern, the Traveler Ultra-Light Electric should be high up on your list. Steinberger is known for their streamlined and compact headless guitar designs. The guitars that they produce are considered highly innovative, which prompted iconic guitarists like David Gilmour, Allan Holdsworth, Don Felder, Eddie Van Halen and more to get one for themselves. Steinberger continues to be the poster child for compact electric guitars, with the Spirit GT-Pro Deluxe leading their lineup in popularity and ratings. This model combines full scale playability (25.5" scale length and 1.625" nut width) with portability at a very reasonable price point. Note that the headless design requires you to use double ball strings, which can be a bit harder to acquire, but it works in conjunction with the Direct Drive R-Trem bridge to give this instrument tremolo control without compromising sustain and tuning stability. While some consider this iteration as substandard compared to old or more expensive models, the overall market response to the Steinberger Spirit GT-Pro Deluxe is still positive - thanks to its impressive quality and value for money. Most users find themselves enjoying the guitar's sound and playability, while others get even better results by upgrading the pickups. Being an affordable mass produced guitar, there are some who noticed minor flaws, but they are not enough to stop users from commending the guitar for its overall appeal and performance. The Steinberger Spirit GT-Pro Deluxe deserves to be a top consideration for guitarists who are looking for a workhorse travel electric guitar. The main point of having a travel guitar is portability and convenience, and this is where size and weight factors in. With this in mind, we have included the weight and total length (where data is available) of the guitars listed, so you can decide on what you prefer. Most of the guitars in this list are expected to fit in the overhead compartment of planes, and are allowed as hand carry. Scale length (length by which the strings are stretched from the nut to the bridge) and nut width (how wide the neck is at the nut) play a big role in playability. As such, it is recommended that you get a travel guitar with similar neck specs as you're main axe. On the flip side, guitars with shorter scale length are generally considered as easier to play. So it will be up to you, whether you prefer uniform playability, or something that's more comfortable to play with. Since travel guitars are lighter and have smaller bodies, they can be uncomfortable to play with, especially when sitting down and not using a guitar strap. Thankfully, some manufacturers provide extensions that let you rest the small body on your legs, much like a regular size guitar would. Just keep in mind that travel guitars will initially feel different, but you will get familiar with them in time. Having the ability to plug your guitar into a portable amplifier is always a nice plus, but it is even better if the travel guitar itself have built-in headphone amplifier for quiet playing. Some even go as far as having built-in tuner and effects, along with an aux input for jamming with your favorite tracks. Just remember to always have spare batteries for your guitar or for your portable amplifier, and you'll be able to practice and jam virtually anywhere. Finally, make sure to get a travel guitar that appeals to your eyes, get one that will inspire you to play more often, because that is the entire point of having a travel guitar. The ones on this list scored highly in this aspect and some of them are available in different finishes - so all you have to do is pick one that tickles your fancy. We first looked at top rated and popular travel guitars, focusing on ones that are rated high and can be immediately bought US retailers. To keep this guide relevant, we processed the most recent ratings and reviews data, including those written in early September of 2018. All of these were then fed into the Gearank Algorithm, which resulted in scores that we used to finalize the list. We ended up dividing the list to two sections, the best five travel acoustic guitars, and top three travel electric guitars. We also included a popular acoustic travel guitar option from a reputable brand. Finally, we sorted the list according to price so you can see which ones fit your budget. For more information about this process see How Gearank Works. Submitted by Rob (not verified) on Sep. 17, 2018. For those interested in the OF660, but not fans of carbon, Journey has collapsible wood models in steelstring and nylon for around $600 with case and pickup. Submitted by Connon (not verified) on Oct. 5, 2018. Snapdragon guitars are amazing and very good value too. Converted some of my mates too. Submitted by James Reed (not verified) on Oct. 8, 2018. Would think you should add the Stewart Travel Guitar Line.